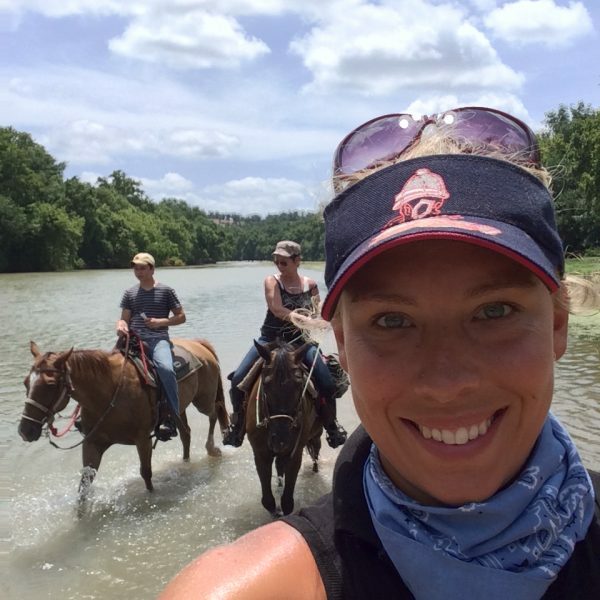 We specialize in providing small group custom-tailored horsemanship experiences to the general public for one-time rides as well as to regular riders hoping to take weekly riding lessons with us. You may here trail companies boasting that they are not “nost-to-tail” only to experience being “wrangled” up and down a beach or along a path. 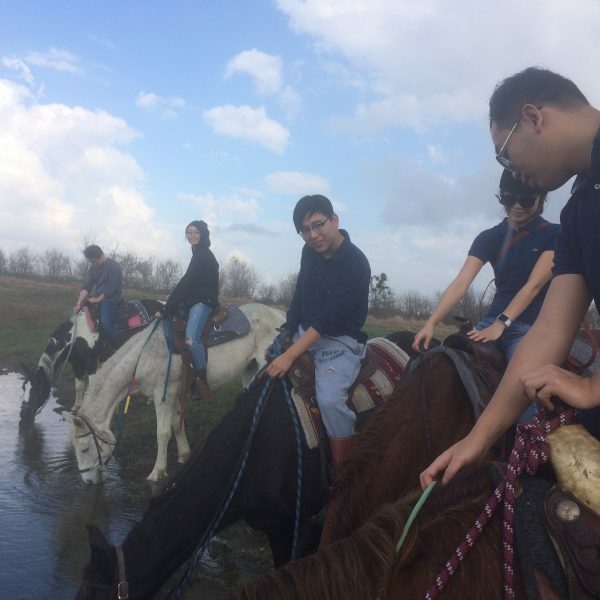 With our horseback riding experience, you’ll be on a real, responsive horse that’s going to change it’s response to you based on the position of your hand, foot, sits bones, head and back positions. Not sure if this is a good activity for you? If you are interested in learning about horses, learning more about horses, or improving your riding (which helps lead to a happier, healthier horse), then this is the right place for you! If you “already know how to ride,” you may be frustrated when our guides suggest you change your hand position by a few millimeters. But that’s the real deal: these are real horses that will behave differently based on such subtleties as how you breath or where you look with your eyes. Personality type and lifestyle activity levels and choices. There are so many examples we could give about how all of these factors come together, and you are welcome to check out our blog roll for more information! In the meantime, if you have any questions about how your unique group or personal needs may be accommodated with our program, please reach out to us. We never let cost impede a group or individual from riding. If you have read our reviews and website and you are familiar with what we do but cannot afford the ride, please call us and speak with us directly. There are always weeds that need to be pulled in our voyage to develop organic grazing land for our livestock. Come get your hands dirty or ask about research and writing opportunities that we have as part of a work-reflect-write-and-ride approach. Please keep in mind that last minute requests for such opportunities are difficult to fulfill. 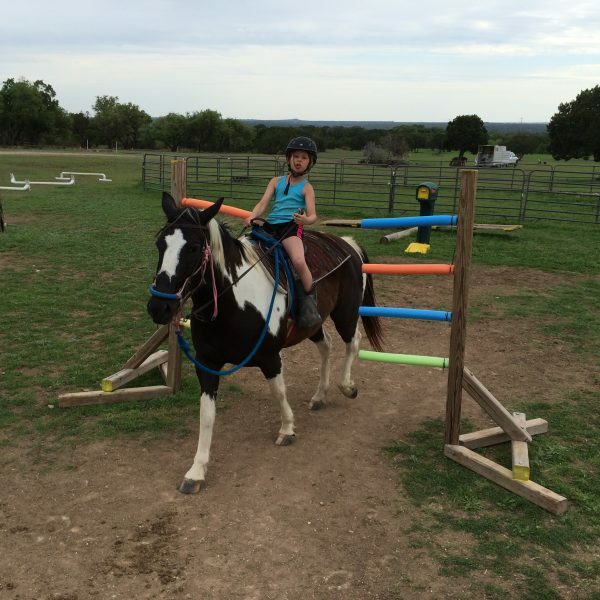 Looking for information on regular riding lessons? The average student who rides and learns with us for a year will spend approximately $35 a session. Please scroll down. Jo Marie here. First, I want to thank those of you who’ve waited so patiently to get booked with us over the winter months. We have had a lot of weather challenges that have given us pause on how to most efficiently execute online bookings at the different locations. Second, as we move through this next step of online booking options, please reach out to us with suggestions or recommendations. Here at Maverick’s I have always appreciated working directly with my community, whether its folks local to our farms and ranches, or the international horseback riding community I’ve started to get to know better and better over the years. Please take a look at the descriptions of our incredible horseback riding sessions on the General Services Page. Our goal is to make sure you understand what you’re signing yourself up for, and that the service meets your expectations. If you have any additional questions, please ask! As always, we ask you to please review our FAQ’s Page before booking and let us know if there’s anything we need to add to our questions list. As a reminder, directions will be mailed upon completion of bookings. All locations listed are within 30-45 minutes of drive time from Central Austin. Incredible panorama views of the valley. Walk, trot, canter rides available to public riders. Eat some of the best BBQ in Texas! Paddle boats, kayaks, fishing, bonfires and more. Rides available Thursday through Sunday at 11am and 2pm. Call for alternate dates. $150 per person. Ride times may change weekly, although we typically have rides available for booking online on Thursday-Sunday at 9am and 3pm. 1 Person: $125 for one horse, one rider, one hour available upon request. Call to book. $250 Online booking options available for a two hour block, minimum. With a gurgling (and seasonally swimmable) creek running through the middle of this gorgeous ranch, you’ll wonder how anything so deliciously quiet and natural could be so close to town. Bunny rabbits, a pot bellied big, goats, lambs, llamas and critters abound! Enjoy an hour and a half to soak in this beautiful space. Riders spend 45 minutes to an hour and 15 minutes in the saddle depending on experience. Generally, rides are right around the hour mark. Pay an online registration fee and pay the rest when you arrive in cash or check. Select PREPAY ALL during booking if you prefer to pay everything upfront. Available: Weekdays Monday through Friday at 10am, 1pm. Sundays at 9am, 11am, 1pm, 3pm. Have a special someone in your life or a group of friends who are fans of motocross? Well this is the ride for you. 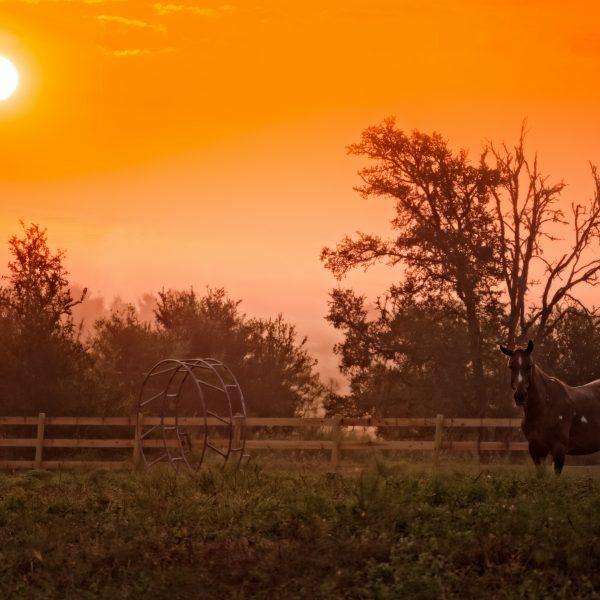 Enjoy a 400+ acre ranch with 1.5 miles of horseback riding on a professional motocross track as well as an additional 4 miles of trails through the woods and fields. 4 People: $770 Join us for approximately 3 hours. Mounted time is approximately one hour and fifteen minutes. 5 People: $880 Join us for approximately 3 hours. Mounted time is approximately one hour and thirty minutes. 6 People: $920 Join us for approximately 3 hours. Mounted time is approximately one hour and thirty minutes. 7 People: $1070 Join us for approximately 3.5 hours. Mounted time is approximately one hour and thirty minutes. Visit us any consecutive week and pay $75. Want to come every other week? It’s $80 a session. Once you’ve paid $825 in 10 weeks, your ride rate is reduced to $50. Students who demonstrate ability to tack their horse unassisted and aid with grooming and tacking demonstrations pay $40 per week. Minors under the age of 10 are required to have a participating parent or adult chaperone. Cancellation Policy: We reserve the right to charge in full for no-shows or cancellations as well as riders who misrepresent their weight by over 10lbs. Thanks for understanding this policy, which protects the health of the horses who make dreams come true. We care about equine health & we know you do, too! Curious? Check out our blog roll for more information on the importance of spinal and digestive care for the success of our program. Don’t want to ride because it’s muddy, it’s raining where you are or you think it might be raining at our ranch? You are welcome to cancel your ride at anytime. There’s a 25% rebooking fee. Maverick’s is sponsoring the Lockhart Public Library for free community education classes this January 2018. Come visit with us this weekend, Saturday 11/18 for free activities for the public at 9am, 3pm and 4-7pm. Click HERE for more information about our Special Event! How about a pony painting session for your birthday boy or girl! Spend 45 minutes painting the fabulous canvas of Maverick, our large, white namesake who humbly stands by as children write birthday messages, make horsey hand prints, or turn him into a zebra or unicorn! As always, the experience caters to each group, but focuses on developing comfort, respect and awe of the horse during unmounted activities. After the work is done, we’ll throw a saddle on this noble steed and children can spend another 45 minutes taking turns horseback riding, learning about posture, hand and foot position, and goal setting. Our birthday sessions remain focused on educating participants on horse safety, horse care and the fundamentals of safe riding. 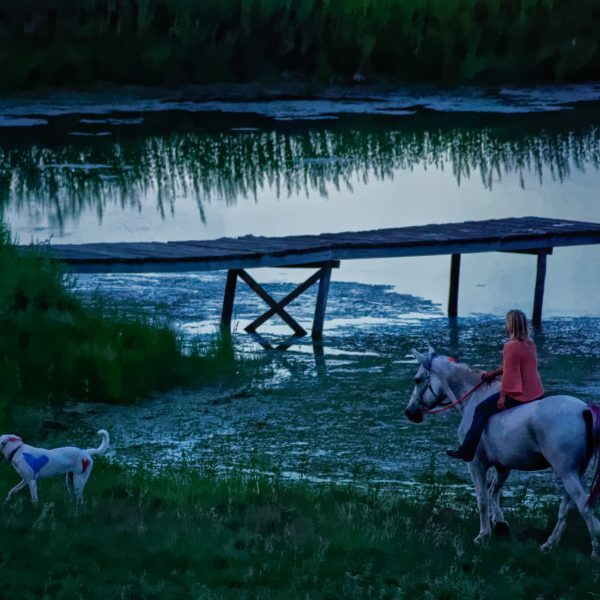 We do not offer “pony rides,” but rather a beautiful experience that engages the senses. What we provide is more of a challenge, and requires children to focus, follow instruction and care for the horse. It’s quite rewarding to little cowboys and cowgirls to know they are giving back to these wonderful animals who offer we humans so much! Have a large event and you’d like to explore venue options? Check out our Special Events Page for more information. 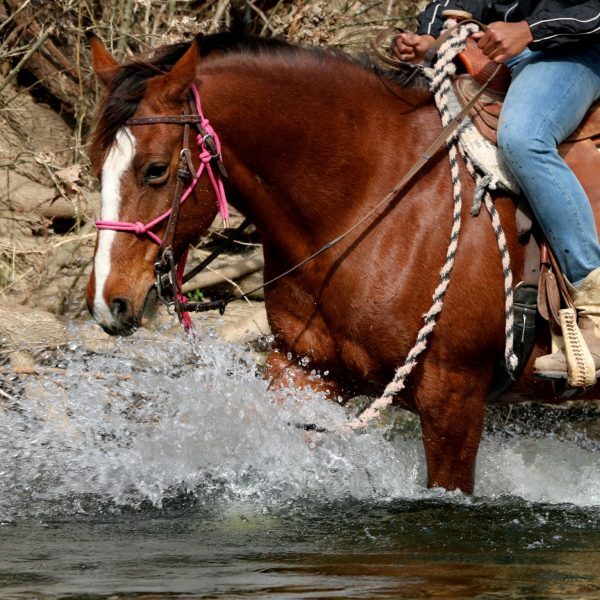 Trail riding lessons can be so exciting for folks who want to get a taste for what real horseback riding is about. We do not believe it’s about riding in circles in an arena three times a week for ten years, and we do not believe its about joy riding the snot out of unresponsive animals that only pick up the pace when they are headed back to the barn. 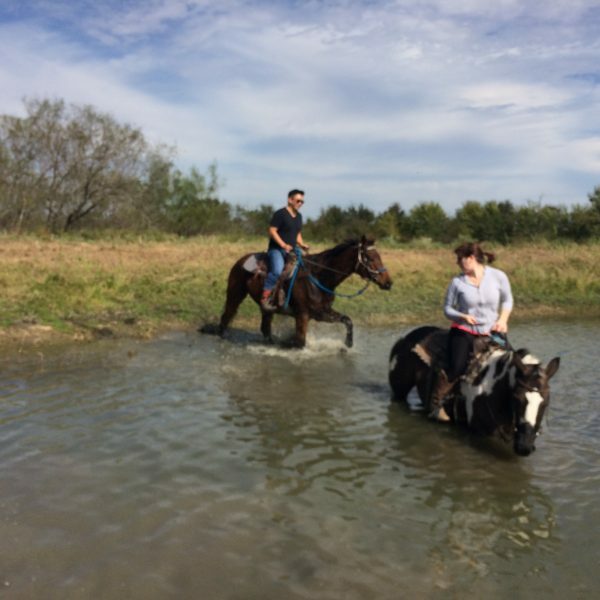 Our trail riding lessons-paradigm on trail gives us the opportunity to educate riders, and this means that we can differentiate our teaching to the individual. THAT means that individuals who demonstrate good balance, good control and kind hands and seat are able to execute more advanced obstacles than others. 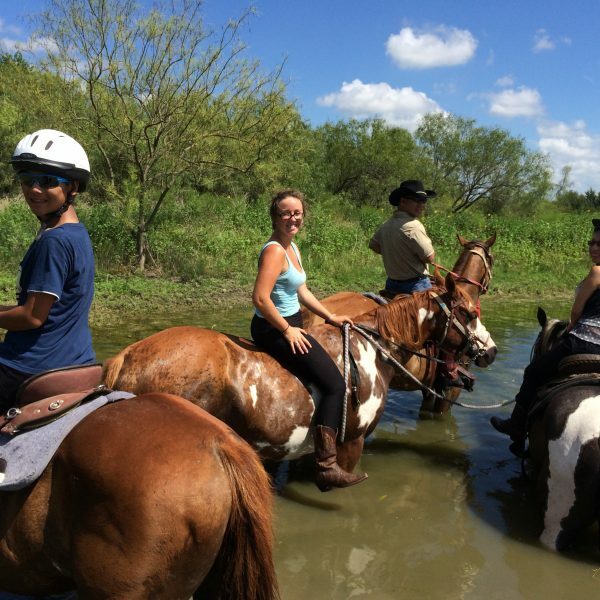 We often ride with mixed skill-level horseback riding groups on trail, and we are happy to work with more confident or more experienced equestrians to be able to pick up the pace, have a little extra fun and experience something a little more gratifying than a trail ride. Visiting from out of town? Ask us for recommendations on beautiful places to visit in San Marcos and South Austin. 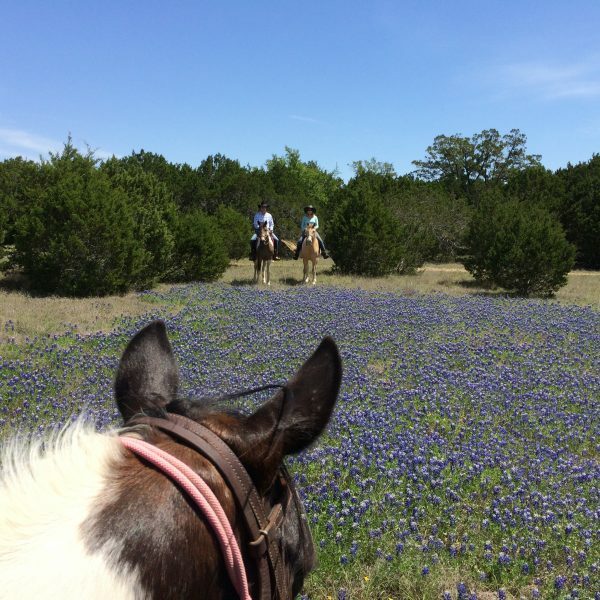 At just 20 minutes away, we are the closest riding ranch to downtown Austin. Enjoy splashing around in our lake on property or check our our beautiful creek! We offer rides to horse enthusiasts of all ages. Children as young as 2.5 can get involved. Call for details! Horseback riding over the hills and through the woods, and to the water, of course, for a little sip. 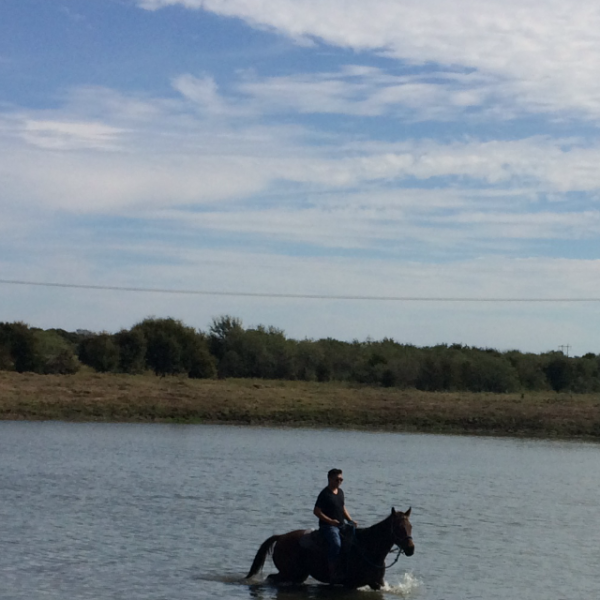 Take a romantic vacation to PAIRRIE HAYNES in KILLEEN TX with your horses, or use some of ours! Views from our ranch, when the lake was low during drought. Still beautiful and nice for a good swim. 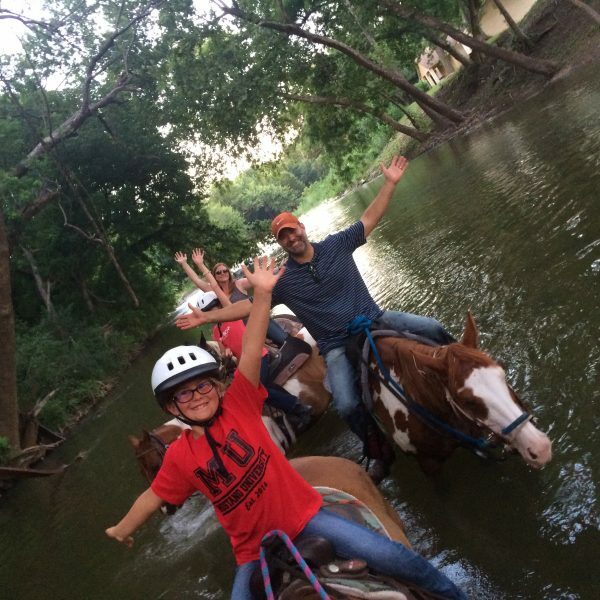 Horseback Riding in the Water is always a fun time at our ranch!